Soneva Kiri is a luxury resort on a large yet barely inhabited island of Koh Kood, surrounded by white beaches and a lush rainforest. A place, where you will discover Thailand like it was back in the day. The all-villa resort is complete with infinity pools, personal electric buggies, and private butlers. Choose anything as intimate and as Beach Pool Villa Suite or as lavish as the 6 Bedroom Sunset Ocean View Reserve. The environmentally friendly design is seen throughout the property, blending in to its surroundings with minimal impact.Families will love the Den, a large bamboo playground, dedicated to learning through creative and meaningful experiences. The Spa is open for authentic Thai treatments, like mud massages, herbal baths, or a silk facials. End the night at the open air and jungle-enshrouded Cinema Paradiso or watch the night sky at the Observatory. Stay above the clouds along the luxurious California coastline at Post Ranch Inn. Mountains. Pacific Ocean, melting into the horizon. Redwoods. Unspoiled nature all around you. Choose between staying at the Cliff House, where you take in magnificent ocean views from a glass-walled free-standing structure. Pacific suites with a 180 degree view of the coastline. Peak house for a private mountain view. The Tree House, which sits on stilts nine feet of the forest floor and includes a skylight for nightly stargazing. Mountain House, echoing the shape of the Redwood trees and offering breathtaking views of the Santa Lucia Peaks and Ventana Wilderness. For a group larger than two, enjoy the Butterfly House or the South Coast House, where you will enjoy a private terrace and floor-to-ceiling windows, overlooking the Pacific. Enjoy morning yoga and meditation, afternoon hiking, whale watching and nightly stargazing. You don't have to wander far to explore what California nature has to offer at Post Ranch Inn. Located in the middle of the Indian Ocean and belonging to the dreamy tropical nation of Maldives, PER AQUUM Huvafen Fushi is truly a remarkable place. The modern boutique feel as well as its underwater spa really make Huvafen Fushi stand out from the rest. Every room and bungalow is equipped with a private pool, with the ocean just a few steps away. Painted in pastel and earthy colours, the rooms have everything you need from oversized beds, Bose surround system, espresso machines, rainfall showers and all imaginable bath necessities. This place was created for peace, pleasure and comfort. If you are interested in getting married in the Maldives, Huvafen Fushi organizes weddings in a coral cathedral, on paradise beaches or even underwater for a truly one of a kind experience. DEDON Island is a one of a kind luxury hideaway, located between two saltwater ecosystems on the island of Siargao in the Philippines. Surrounded by coconut groves and mangroves trees, the resort sits on a stunning private white sand beach. Imagine an untouched tropical environment seamlessly blending in with modern and whimsical design elements created by DEDON (a luxury outdoor living space company). Stay in one of nine Superior or Deluxe Villas with a private porch and an outdoor shower. Hide from the sun in one of the famous NestRest pods. Climb up in the Treehouse for a yoga class or destination dining. Relax in the gardens, surrounded with frangipani, orchids, and lilies. 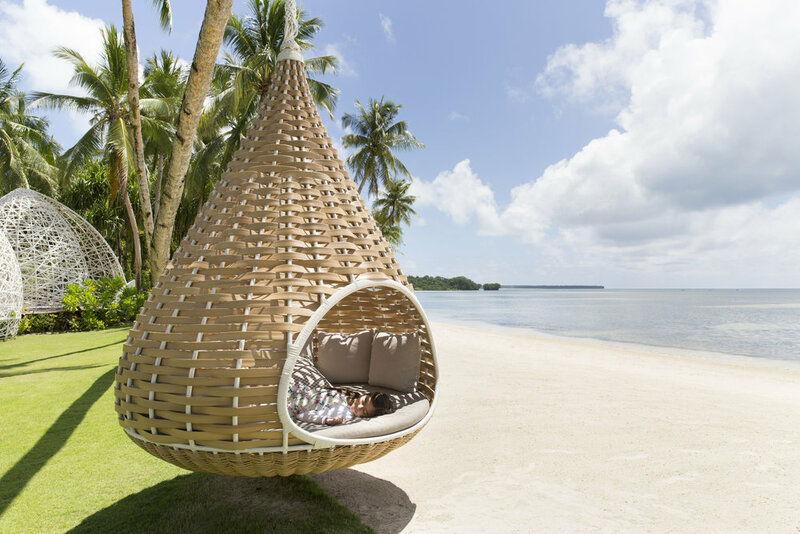 Dedon Island is all about taking off your shoes and embracing the island way of life. The Berkeley River Lodge is a true dream escape in one of the world’s finest natural settings. Luxury villas sit atop a 65 metre-high dune offering panoramic views spanning a gulf, gorges, river and an island. The hotel was designed to blend in with the coast allowing nature to do the talking in this most rich and vivid landscape. Described as “God’s Land”, you'll savour this divine and life-changing experience.